I have a beautiful artificial Christmas tree. I grew up in the age of tree huggers, when young people and hippies objected to cutting down trees. It was the environmentally smart thing to do. 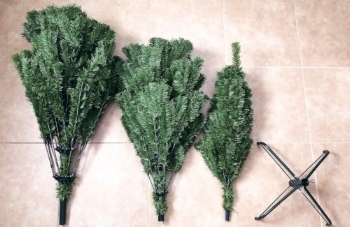 You don't have to cut down a living tree and once purchased, an artificial tree can be used over and over for many years saving as many as 10 or 15 trees. Smart! Maybe not. We know so much more now. But many of us who are environmentally conscious still believe it is probably the green, sustainable thing to do. Well, we have come to learn that a fake Christmas tree must be used for at least 20 years to justify not cutting a fresh tree every year. Consider the manufacturing of the artificial tree for starters. I won't get into the scientific data but greenhouse gas emissions, energy consumption in manufacturing and transport of materials and finished product (often from China), and the carcinogens produced manufacturing PVC derived from oil creates a substantial environmental impact. At the end of the fake tree's life there is also the disposal of PVC in landfills. There is also steel in the branches of course that does not get recycled. On the other hand real Christmas trees are not just trees arbitrarily cut down and lost forever. They are sustainably farmed and replaced like a crop. Rather than producing carbon emissions, they soak up and store carbon. A real Christmas tree is completely biodegradable. Minimal amounts of carbon are released in decomposition or burning, but far more is again taken out of the environment with the replacement tree crop. And if properly retired into your backyard landscape, additional environmental benefits are achieved with the real tree. So, you decide. Artificial or real? Although I may not have made a well informed decision when I purchased my artificial tree, I am redeemed by reaching 21 years of use so far.